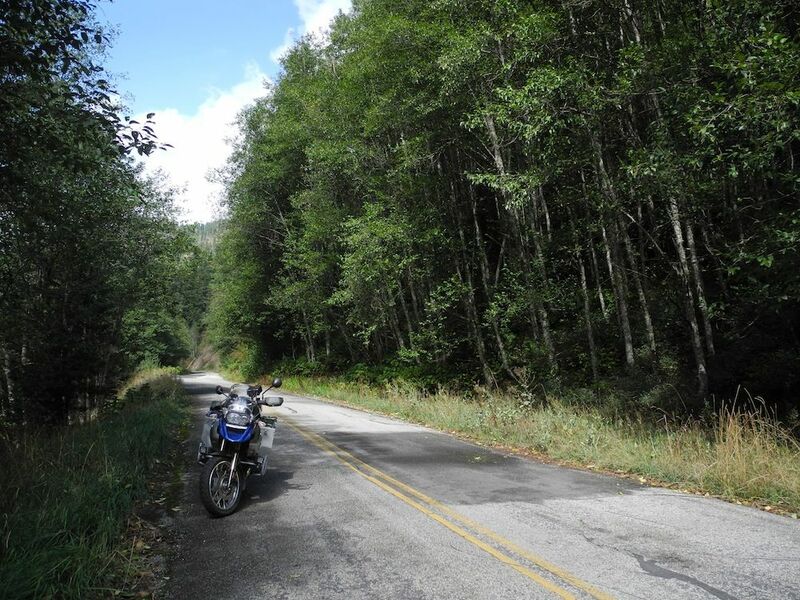 Last year's schedule wouldn't allow me to attend the 2012 Rally in early September so I planned not to miss the combination 2013 Happy Trails / Idaho Adventure Motorcycle Club Rally and Ride in Kamiah, Idaho. 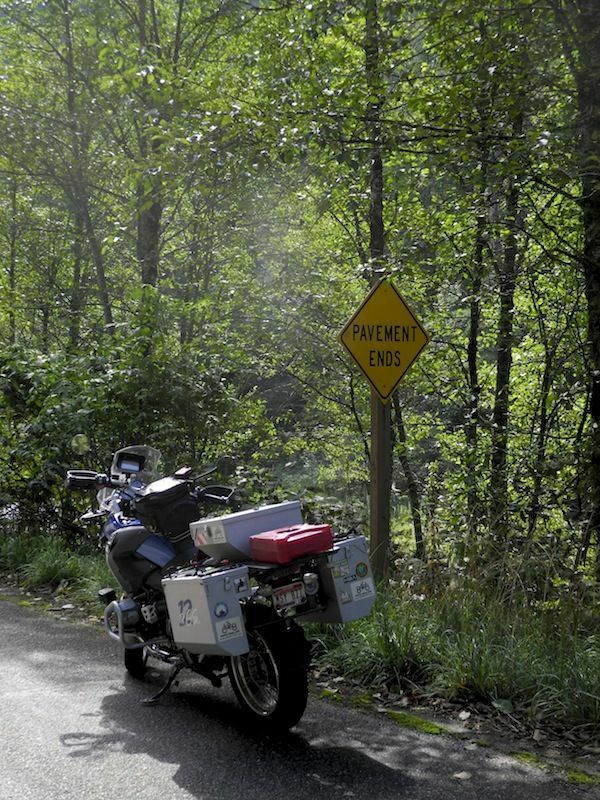 I've ridden in this part of my state but there were some missing checks on my Bucket List so I determined to take those in for sure this year. 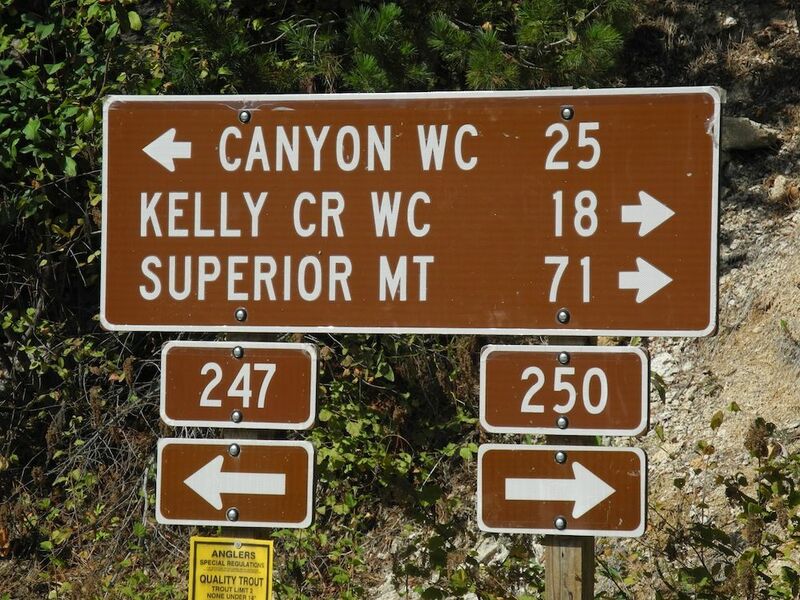 Also on the way to and from the Rally I would be able to tag a few of the 2013 IAMC Challenge sites. 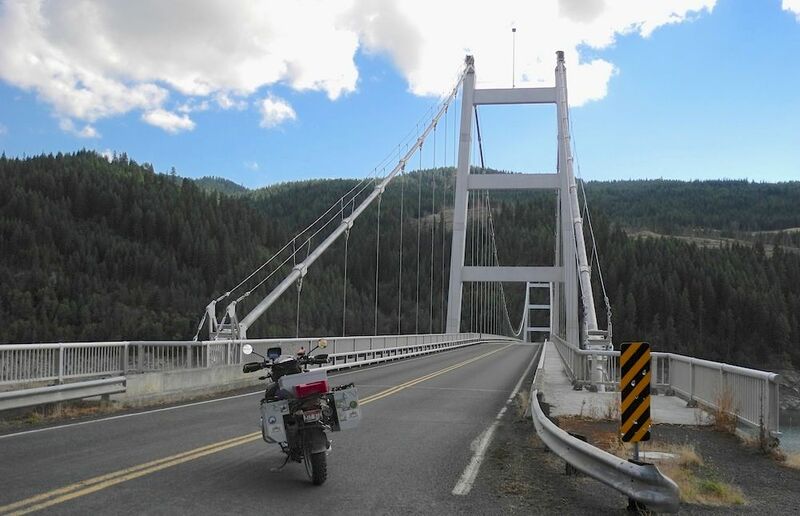 Thursday morning I pulled the shop door down and traded the congestion of the city for the sublime curves of ID55 through Payette River Canyon to Cascade and Round and Long Valleys. 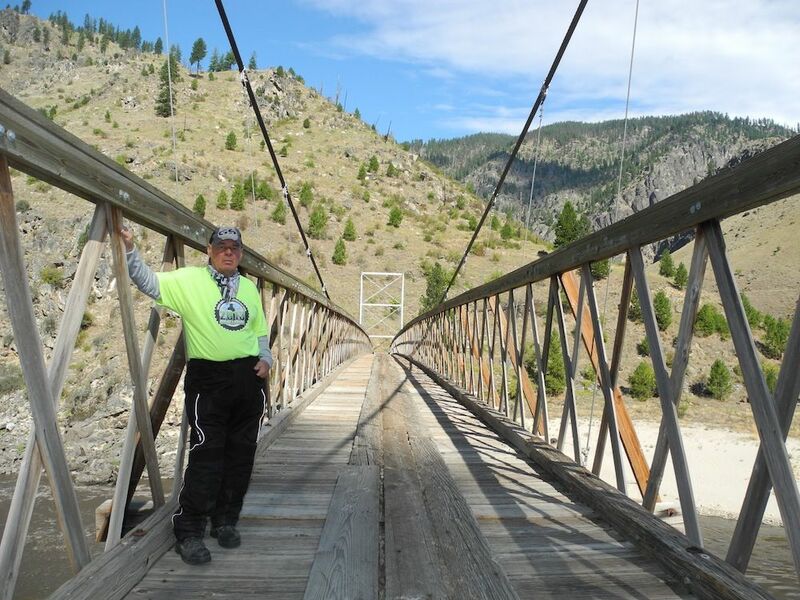 After the descent along the Little Salmon River I stopped for turkey on sourdough at Kate's in Riggins then began the search for The White Bird Battlefield Challenge site #8. 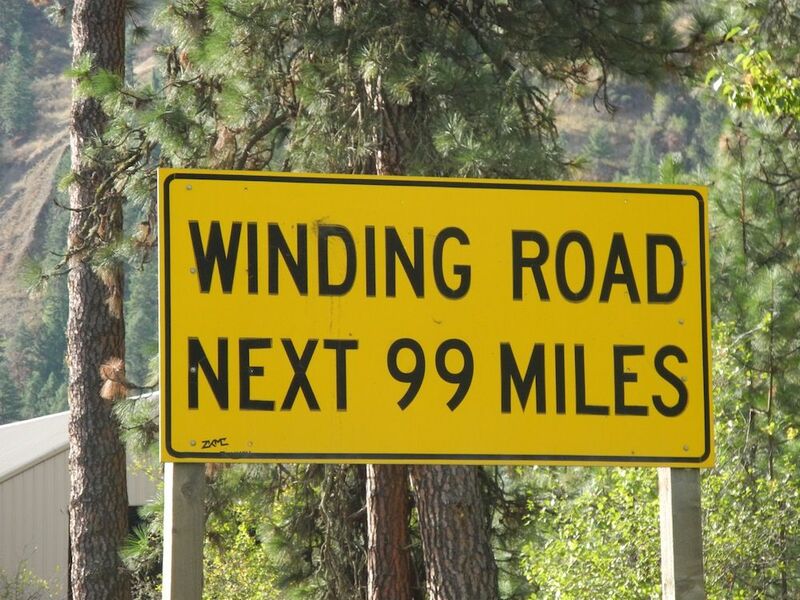 The actual site has an interpretive trail and is on the Old Whitebird Highway far below the Historical marker on US95. 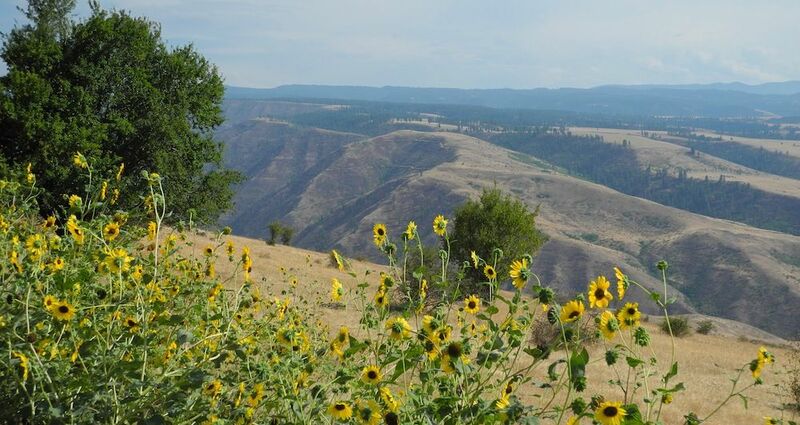 The prolific wild sunflowers along the Old Whitebird Highway Grade made a fitting foreground for the ridges above Whitebird Creek. 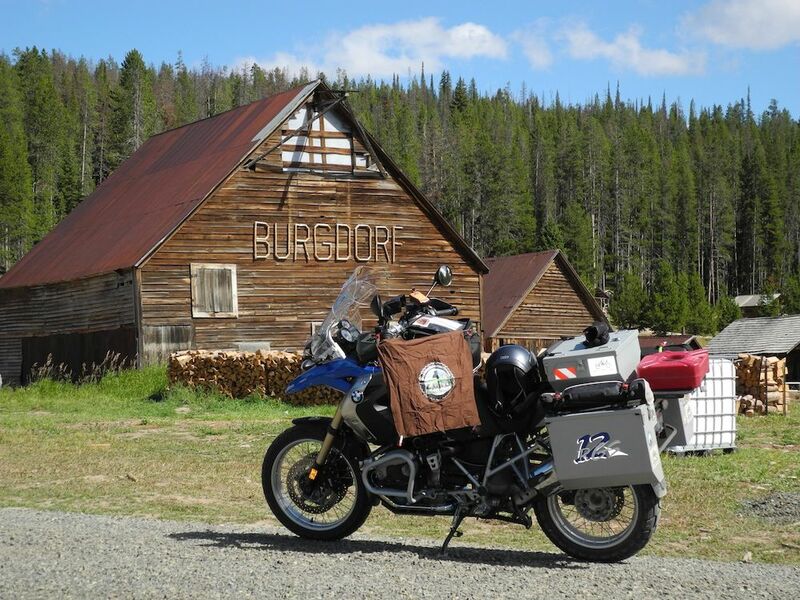 I stayed on the Old Whitebird Highway north of the summit where it joins US95 across from the Johnson cutoff and rode on toward Nezperce then down ID162. Arriving in Kamiah I checked into the Clearwater 12 Motel and motored on to the Lewis and Clark Resort for club gathering and cheeseburgers hosted by capt.ed, our club president. It was great to see riding friends and renew old acquaintances. Next morning I led a small contingent of dualies up Greer Grade (5 star) through Weippe, Pierce and Headquarters to Aquarius. 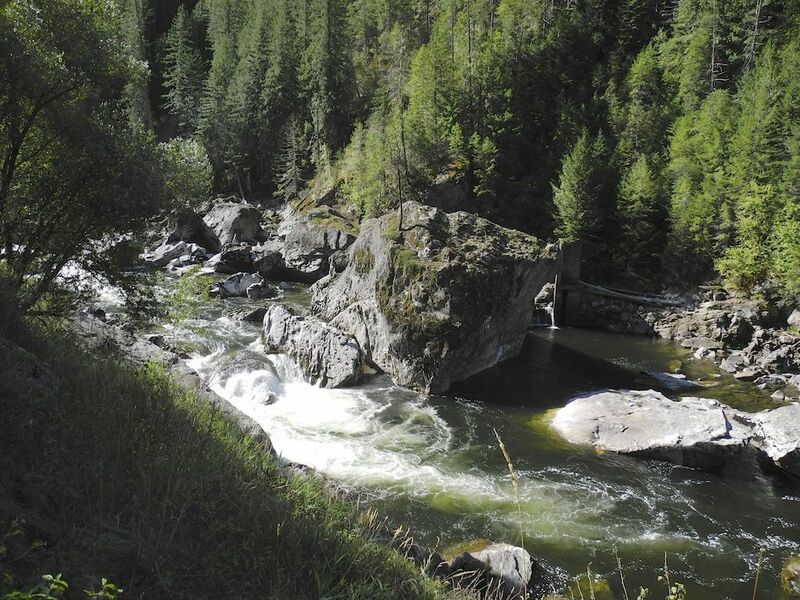 The bridge there crosses the North Fork Clearwater River. Having previously ridden to Grandad Bridge over Dworshak Reservoir and to Elk River, I opted instead to ride solo the North Fork upstream to Bungalow as this stretch was on the Bucket List. 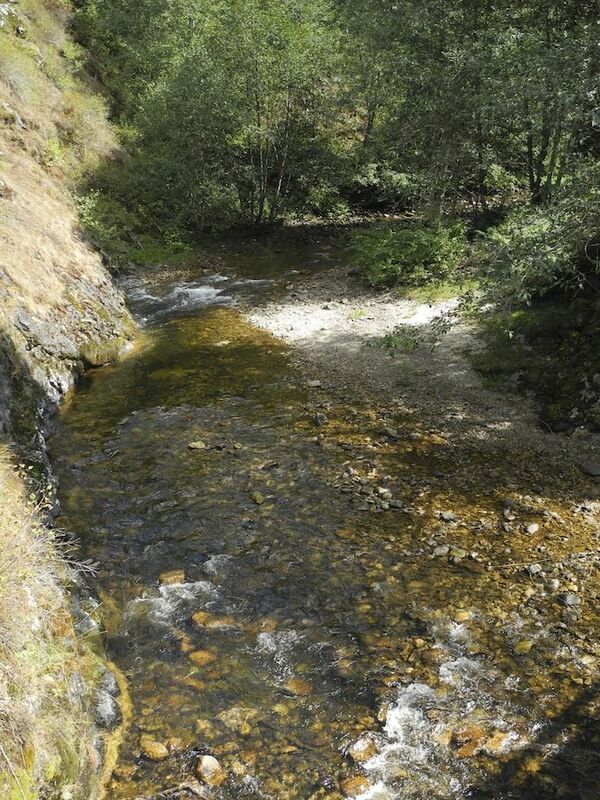 Twin Creeks spill from the steep terrain and flow under NF247. 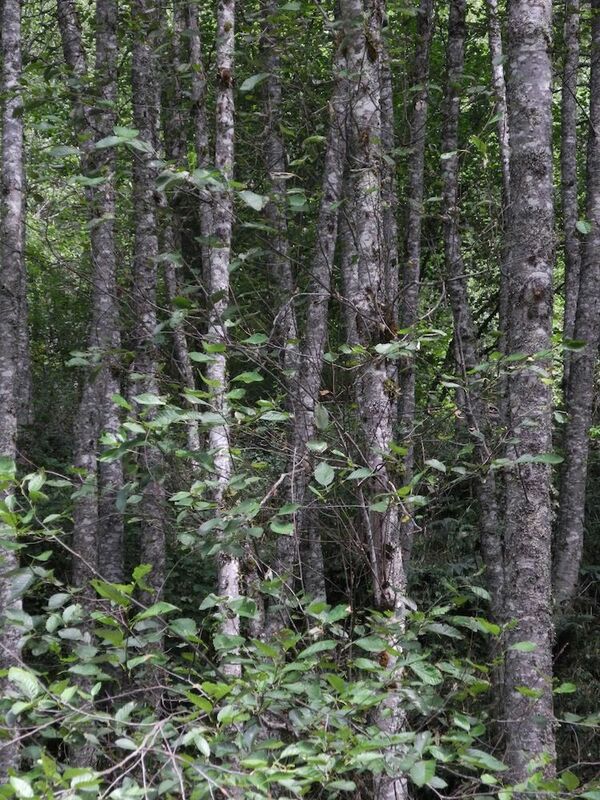 Tunnels of Alder arches line the way. 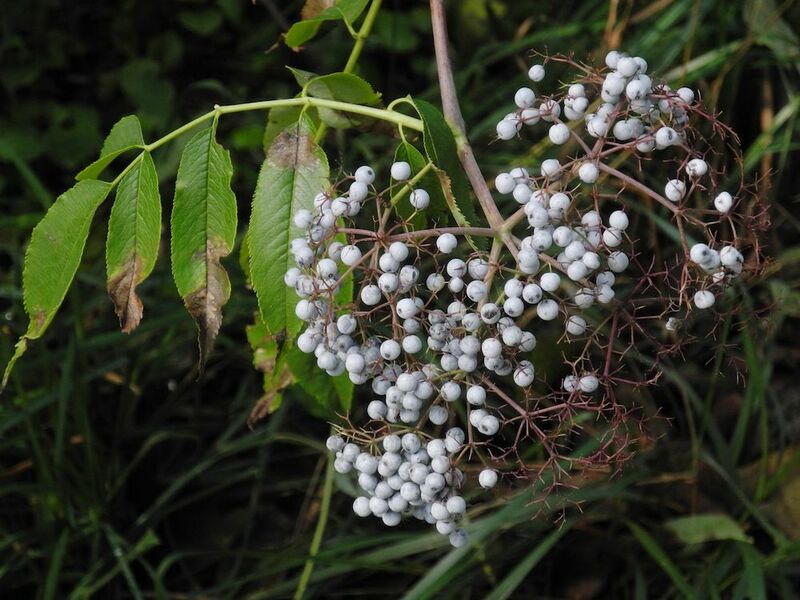 Ripening elderberry fruit waits for first frost. 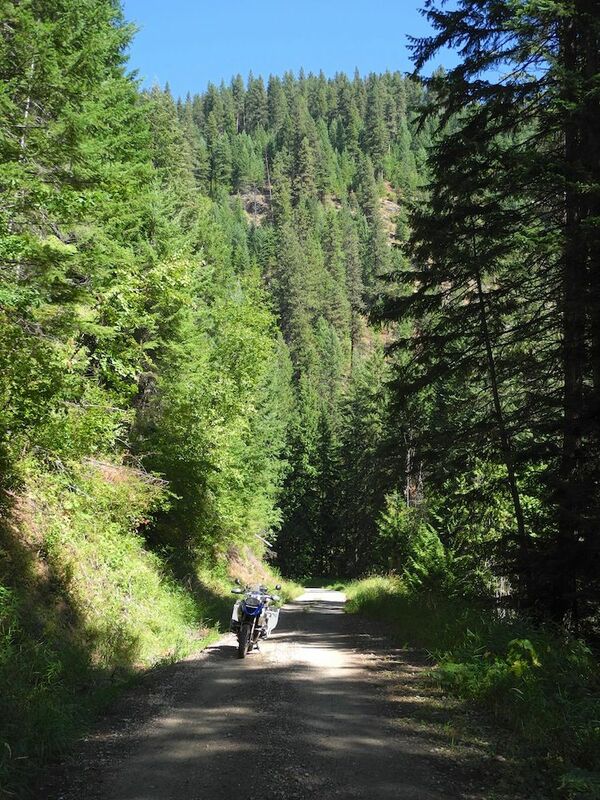 The day began as rain threatened to dampen the ride but the clouds burned away and sun drenched the lush cedar forest . 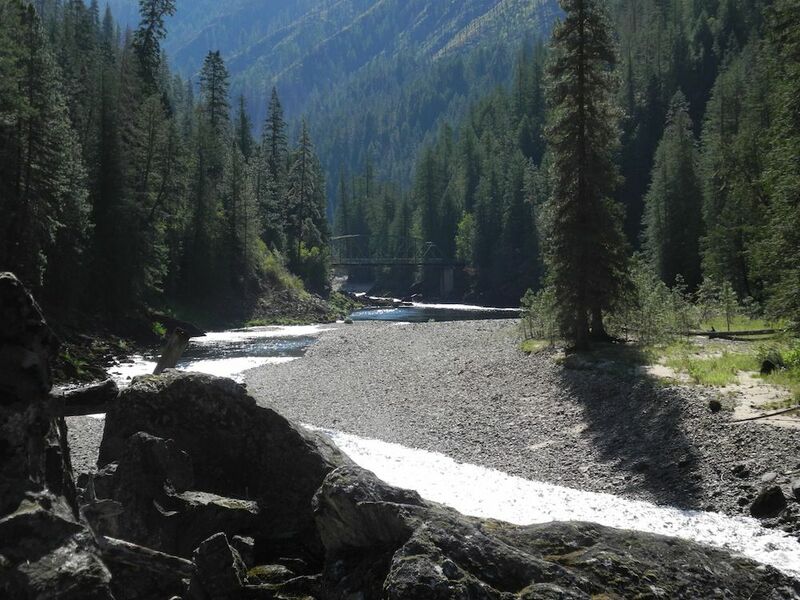 The confluence of Quartz Creek as the North Fork Canyon begins to widen. 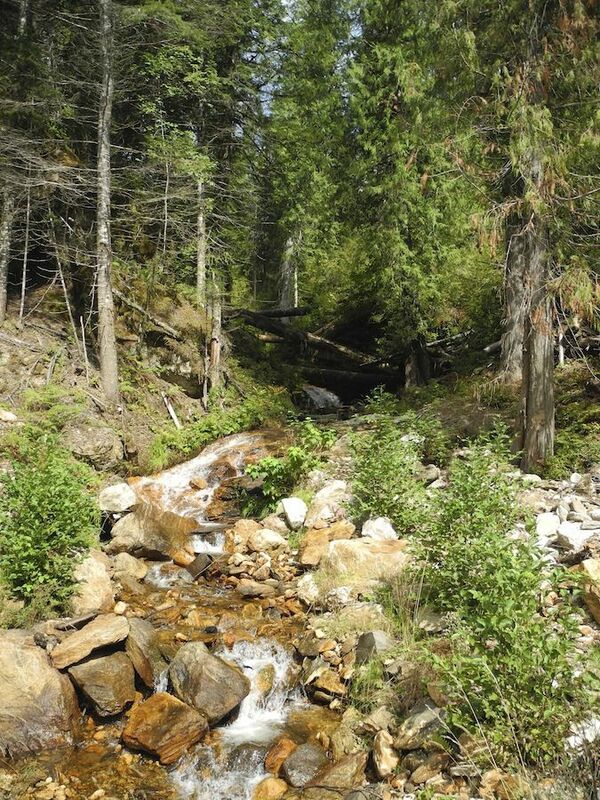 Near the mouth of Rock Creek I saw splashing fish and after investigating realized they were kokanee salmon on the way to their spawning grounds. After a dozen exposures I finally captured a buck in mid-leap. The scenery here is definitely worth the effort, plan extra time to linger and make photographs. Castle Rock looms above the track. The sign at Bungalow bridge. 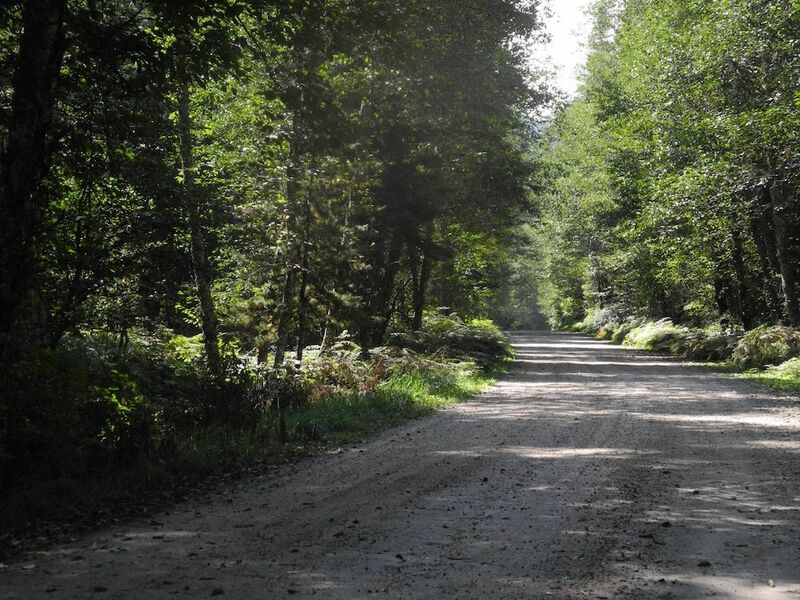 A deep gravel ride up French Creek, NF250, to Pierce, west on Grangemont Road with a side trip on Johnson Mill Road put me on Dent Bridge Grade. Three riders were parked on the Bridge's far side so I stopped to learn they were from Michigan, wish I'd photoed 'em. 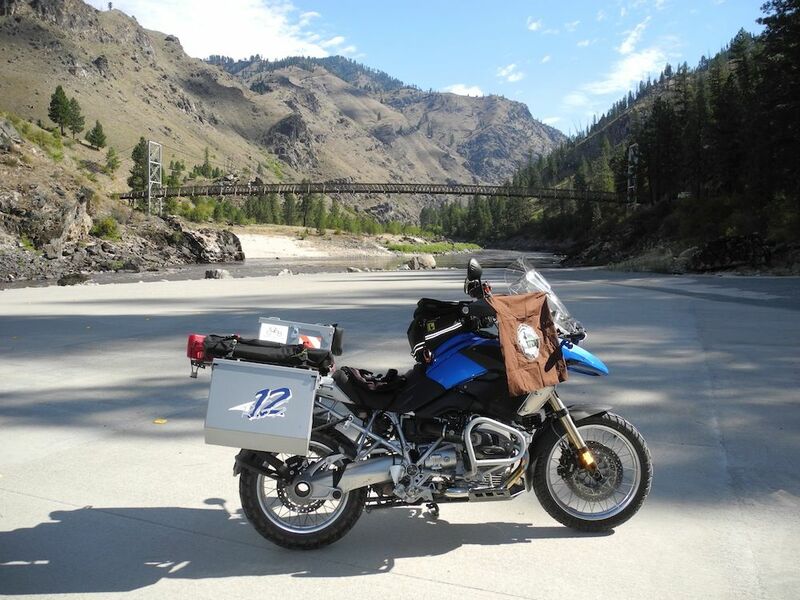 After a picture proof I settled into the ride back to Kamiah through Orofino and along the Clearwater on US12. 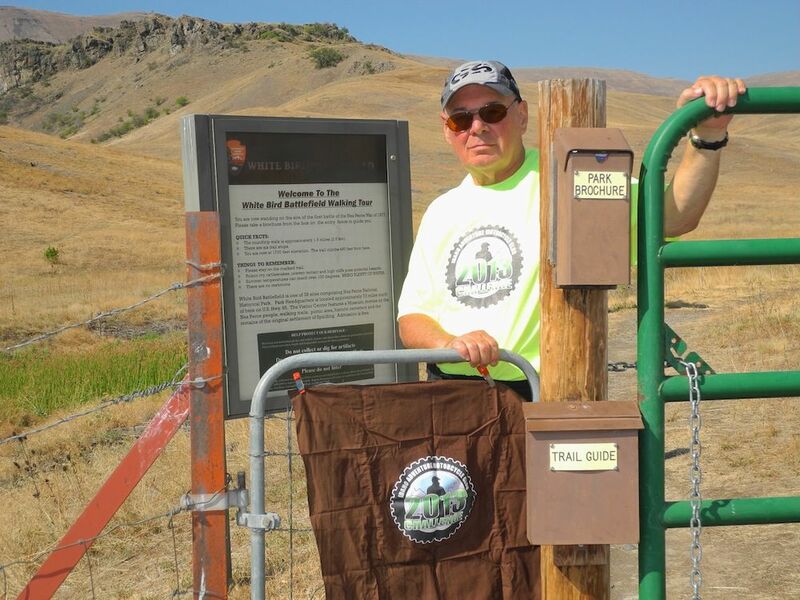 Happy Trails would be hosting a great dinner and entertainment at the Lewis and Clark. 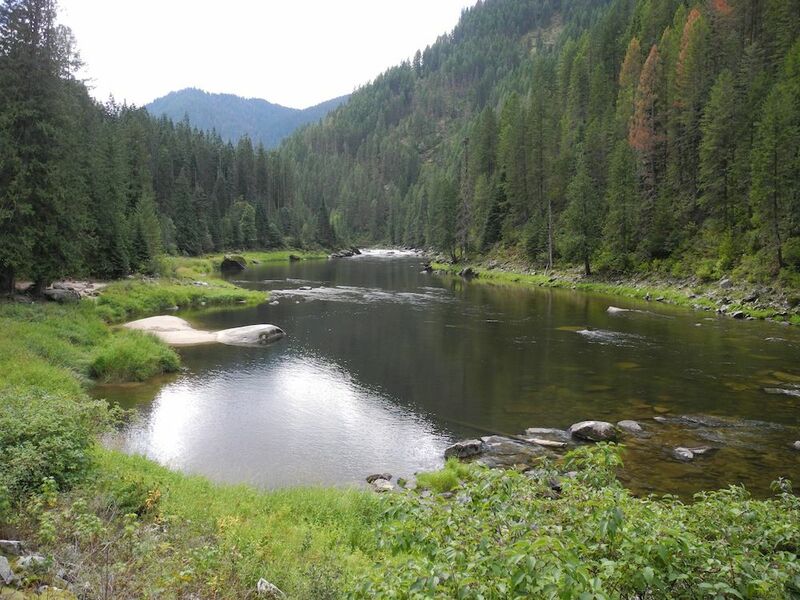 Next morning I again struck out solo to check some more off the Bucket List, heading up famous US12 (Lolo) along the Middle Fork Clearwater River to Lowell, elev. 1,480'. 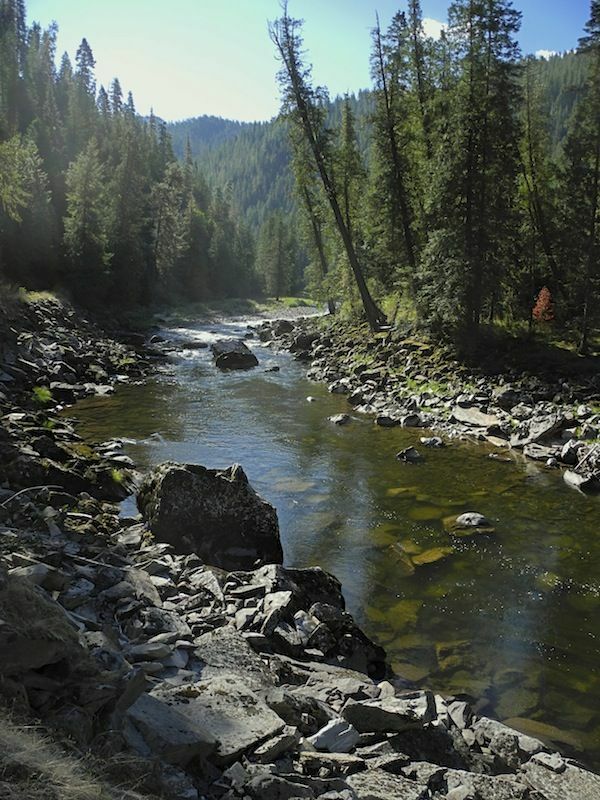 Famous Selway River flows northwest from the Frank Church Wilderness over Selway Falls to Lowell where it joins the Lochsa River to form the Clearwater River's Middle Fork . 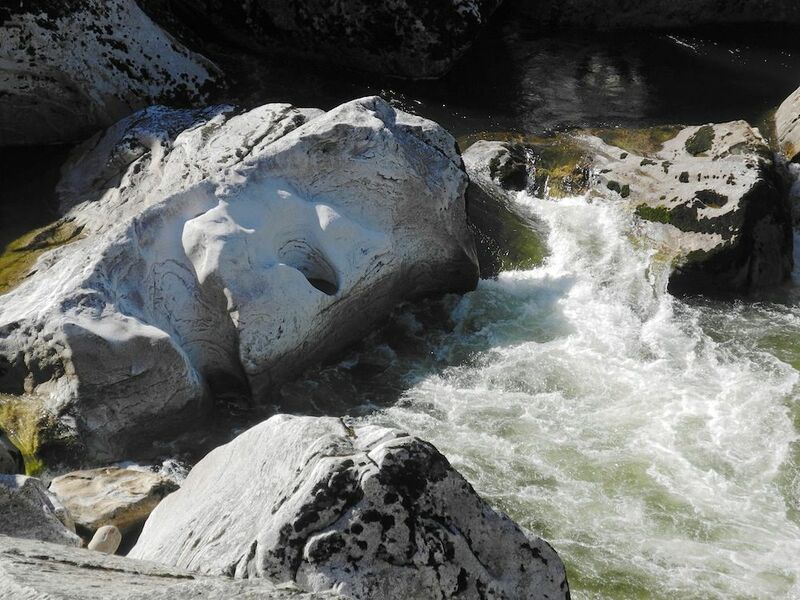 September and a drought year make it hard to imagine the timeless forces at work in the cataract during spring runoff when the river is at its full strength. I plan to return and see for myself. Returning to the bridge at O'Hara Creek I crossed the Selway on NF651 and ascended to Hamby Saddle where Heidi needed a break then began the descent to Elk City, elev. 3,980'. Near Nugget Point I parked and got a shot of Pilot Knob, elev. 7,135', and Pilot Rock, elev. 6,952'. Panorama of Elk City basin. After a great cheeseburger in Elk City, I rolled up the Red River Road to the ranger station near the entrance to Magruder Corridor. 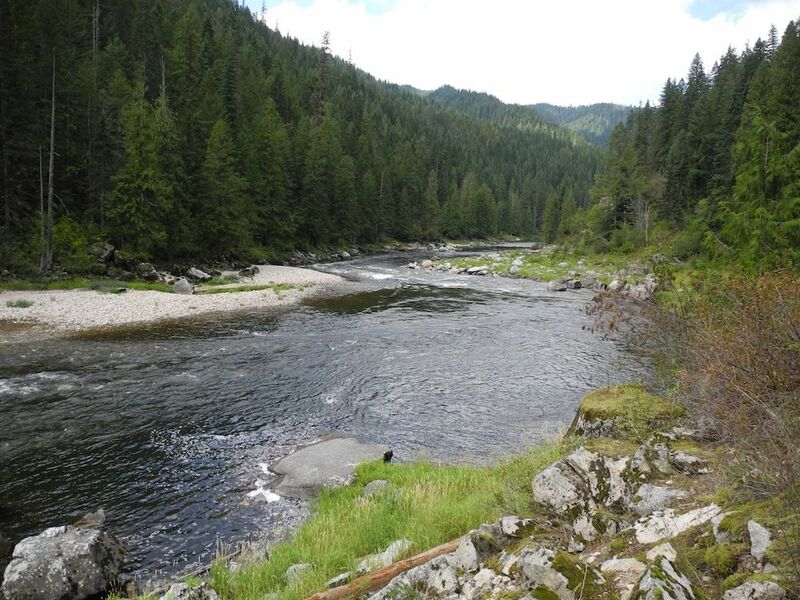 The day nearing and end I returned to Kamiah along the South Fork Clearwater River on ID14 and ID13 with side trip to see Clearwater, elev. 2,544'. Happy Trails hosted a banquet for many hungry, some battered, dual sporters followed by more entertainment after which I cruised the short distance to Kamiah and a great bed. Next morning I began the return ride planning stops for two more Challenge sites. 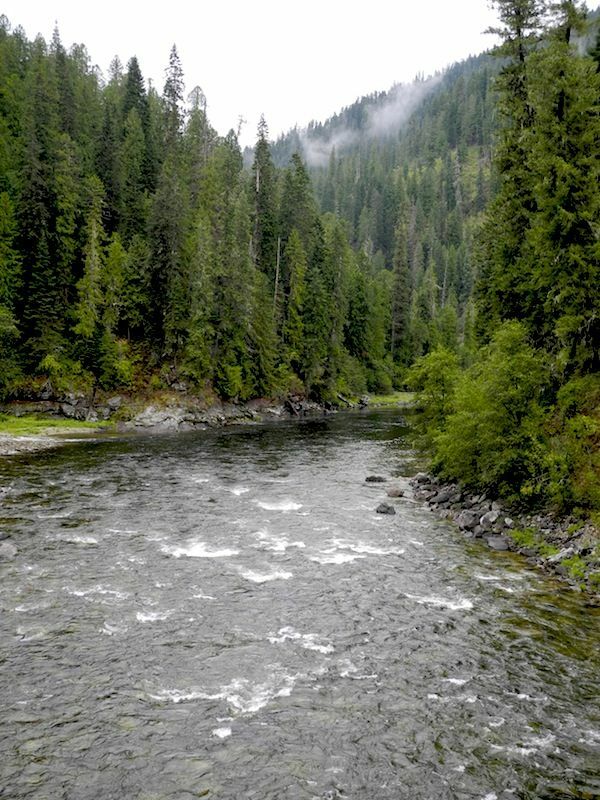 The normally emerald clear Main Salmon River was increasingly muddy as I rode, it appeared there had been a major blow-out and mud slide upstream. While I posed on Wind River Bridge, Challenge site #36, Heidi glammed it up on the Wind River boat ramp near the end of Big Salmon Rd.. 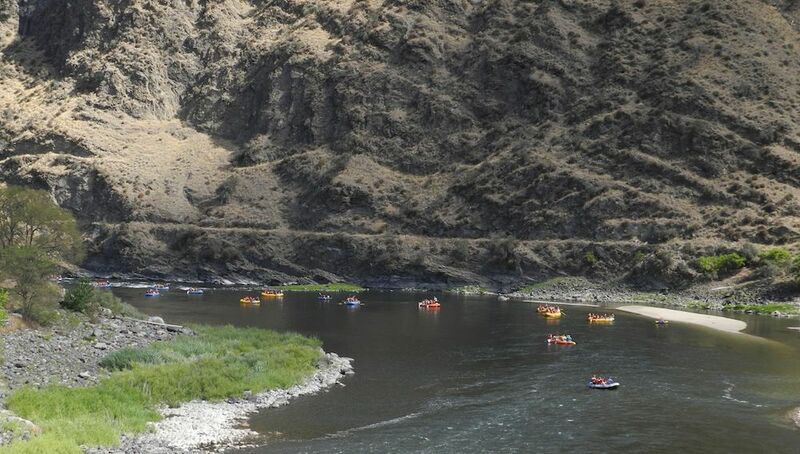 The water quality did not seem to discourage a large flotilla of what sounded like screaming teens from enjoying the white water experience. 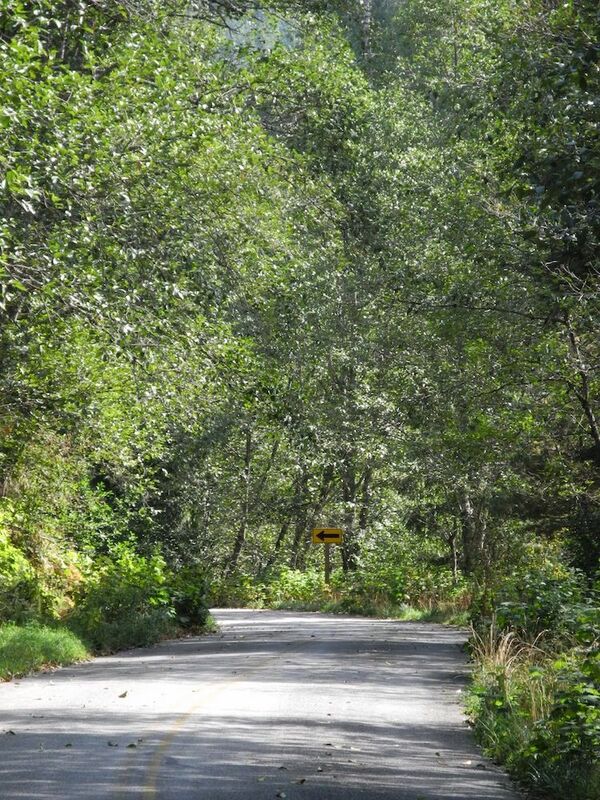 The ride up French Creek Grade to Burgdorf Hot Springs, site #20, elev. 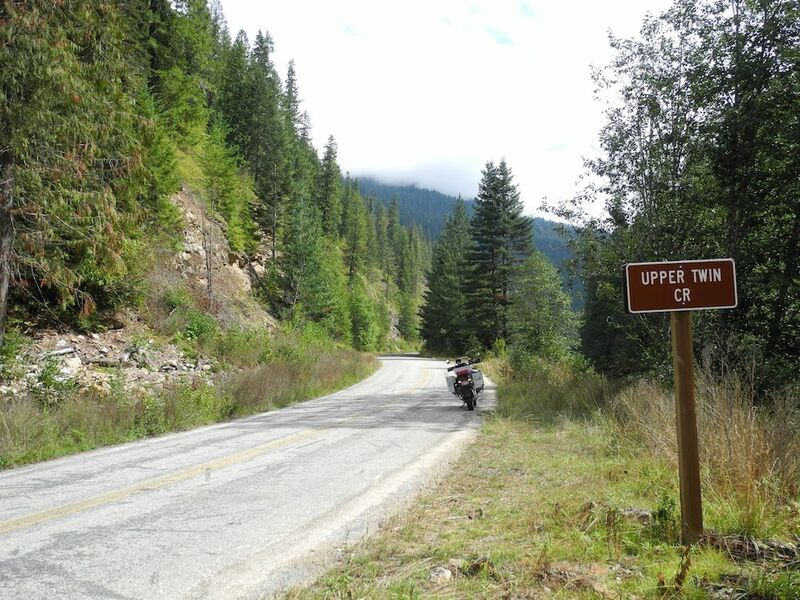 6,140', would have shortened the return trip by more than an hour but that route was too daunting on a fully loaded GS riding solo so Heidi and I decided to ride to McCall and north on Warren Wagon Road. Returning to McCall we rode south on ID55 and found home again. Total GPS miles = 1,107, 7:41 moving time. Thanks for a great weekend Tim and Ed. 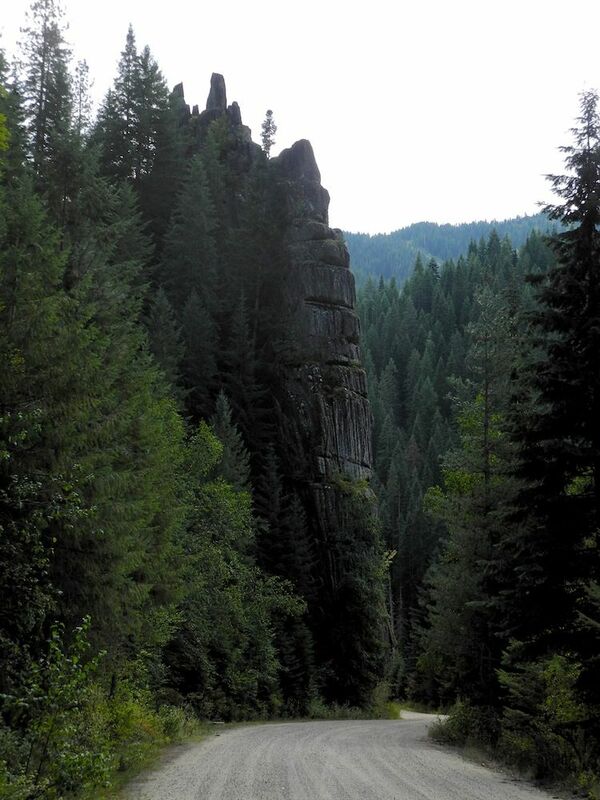 Far Northern Idaho is so foreign to us desert dwellers that it is truly a delight to ride there. I did miss out on the group rides as I had a Bucket List agenda but next year ....?